Seek solace in great design. 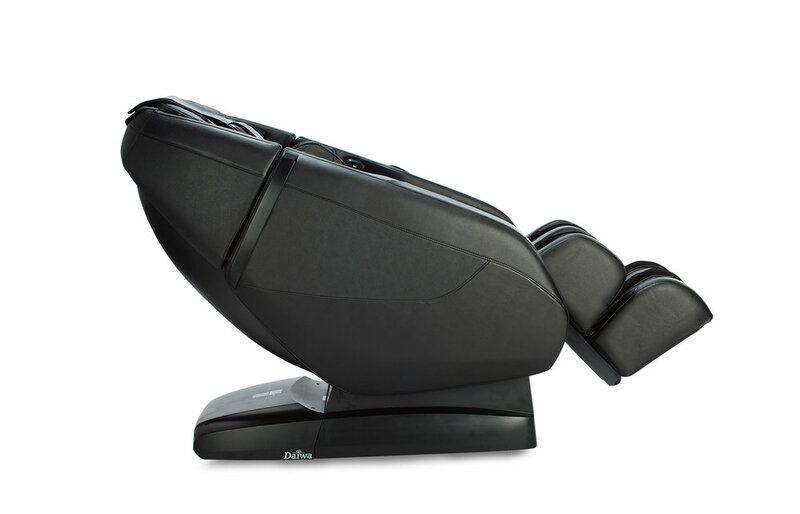 The Daiwa Solace massage chair offers whole-body wellness based on advanced engineering. 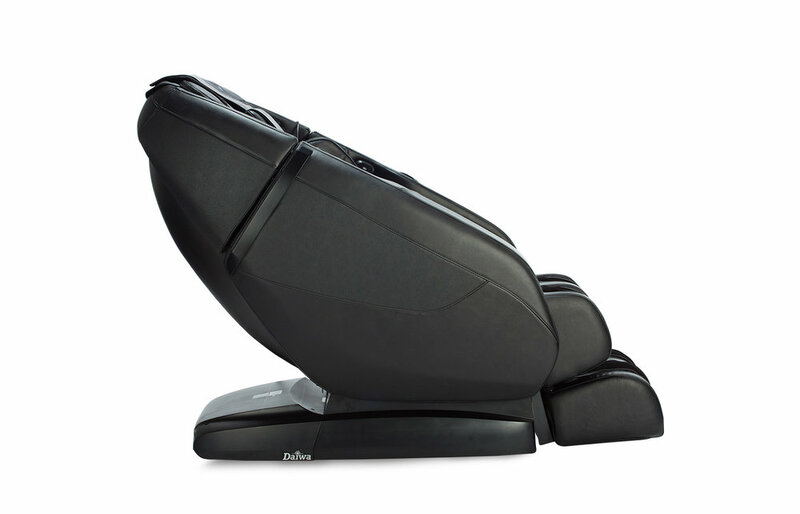 The Solace delivers a professional massage, and has advanced features like heat, and zero-gravity positioning. Get a break from stress, treat chronic pain, and revive while lounging in a chair that takes up little space and looks great. The Daiwa Solace features an extra-long, L-Shaped Massage Track that runs from the top of the shoulders to the bottom of the hamstrings. Unlike most other luxury massage chairs, whose S-Shaped Massage Track limits reach to the backrest only, the Daiwa Solace offers a supreme full-body massage experience. The Solace's gliding recline mechanism takes up much less space, allowing the entire chair to fully recline when placed just 3” from any wall. While other recliners require up to 20” of space, the space-saving design of the Solace combines comfort with practicality. The Solace uses advanced technology and therapeutic features to deliver unsurpassed full-body massage therapy. Its space-saving design packs powerful features into a compact chair that fits right in your living room. Despite its compact design, the Solace features a roomy interior to fit many body types. Adjustable massaging shoulder pads can be raised to give up to an additional 3 inches of coverage, in order to accommodate taller individuals. Simply rotating them 90º allows the inflating airbags to target key shoulder muscles. The extending foot and calf massage unit slides out up to 5.5 inches, ensuring a tailored leg massage to users of any height. Before beginning any massage session, Body Scan technology maps your entire back in order to provide a custom massage that is contoured to the unique curvature of your spine. The Zero-Gravity Recline shifts the angle to one of two positions, evenly distributing body weight and reducing pressure on joints and organs. You'll experience a floating sensation that over time reduces chronic pain. The therapeutic heat feature gently warms the lumbar (lower back) region to maximize the effect of the massage, helping to ease tension, reduce stress, and alleviate muscle stiffness and soreness. Built into the chair are 42 Airbags that rhythmically inflate and deflate during your massage session. These airbags gently stretch muscles to melt tension, improve circulation, and ease body fatigue. Airbags are located on the shoulders, around the arms, and even under the thighs and calves in order to apply a full-body stretch. The Solace is the first massage chair to use high-end Saffiano PU Leather in Black or rich Chocolate brown. The Saffiano style was developed by luxury handbag makers to give the leather surface a crosshatched texture that is stylish, durable, and easy to keep clean. Drawing upon the principles of reflexology, our foot rollers stimulate nerve endings on the feet to relieve tension, improve circulation, and renew vitality throughout the entire body. Two distinct foot rollers target specific areas of the feet. The optional foot pads soften the effect for a gentler foot massage. Powerful airbags squeeze the calves to relieve tightness and tension in the lower leg muscles. Powerful airbags inflate and deflate in an alternating pattern around the calves and the feet to relieve tension and improve circulation, while built-in grips gently hold your ankles in place. The Daiwa Solace Massage Chair App connects wirelessly to your Solace chair using Bluetooth. Use the app to access the controls, including activating manual and automatic massage programs, targeting massage to different parts of your body, or varying the massage type and intensity. Keep your devices charged with Solace's convenient USB charging port. Connect to digital music players or phones to play your favorite music while you relax. High quality speakers mounted above the shoulder massagers are aimed at your ears for a surround sound experience. A convenient pocket keeps your controller secure and in reach. Tapping too hard? Turn the tapping off! Our tapping feature is specially engineered to get rid of persistent pain. This technique stimulates blood circulation and can be invigorating to most people, but may be too intense for some. Unlike other massage chairs, you have the option to keep the tapping ON or OFF. This feature can be used anytime during an auto-program. We care about people who suffer from pain but also want to enjoy a massage in comfort. User Height Range: 4'11" - 6'3"